Following Prince Harry’s recent visit to the Whanganui region, where he met with local iwi representatives (and impressed Tariana Turia), much older connections between local Māori and the British royal family are worth remembering. In my recently-published book Haerenga: Early Māori Journeys Across the Globe I tell the story of Whanganui chief Hoani Wiremu Hipango, known to many Europeans as John Williams. 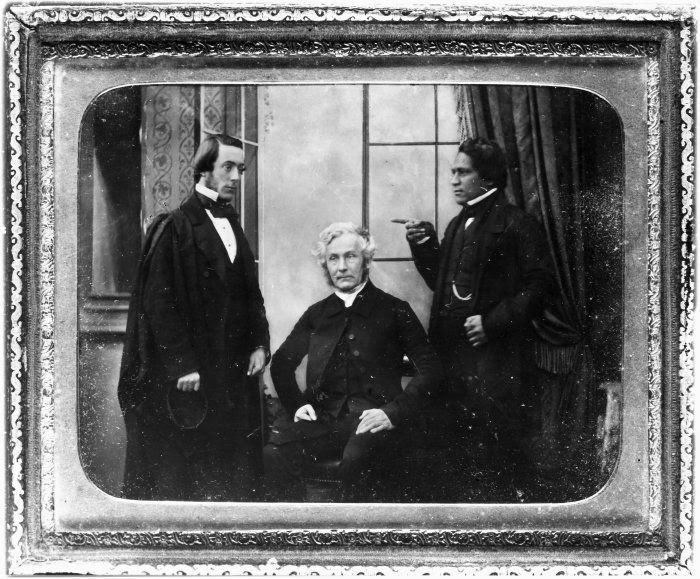 In 1855 Hipango accompanied the Whanganui-based missionary Richard Taylor on a journey to England. During the course of his stay, the young Whanganui leader and Taylor met with Queen Victoria and Prince Albert at Buckingham Palace. Hipango presented the Queen with a prized pounamu weapon, a large cloak made of kiwi feathers, and other items. Victoria took a great interest in the gifts and assured Hipango that she had the welfare of the Māori people in her heart. He became just the second Māori after Tamihana Te Rauparaha of Ngāti Toa known to have met with Queen Victoria. However, it was said that the Queen was so plainly dressed that he did not realise it was her, later scolding Taylor for failing to tell him. Hipango was killed in battle in February 1865 leading an attack on a Pai Marire pā at Ohoutahi. Two years later his son, Hori Kingi Hipango, also travelled to England, where he spent the next four years, before dying there in 1871. The stories of Hoani Hipango and his son are just two of many told in my book, published by Bridget Williams Books, as part of its popular Texts series. The book explores the history of Māori travel from the late eighteenth century through to the early twentieth century. Hipango and his son reflected an almost insatiable Māori appetite to travel and explore the world, although many of these stories of voyaging are today little known beyond the immediate descendants of those involved. As I have been researching the Waikato War one topic that I have devoted considerable attention to is the question of how the war has been remembered or forgotten historically. This was the main focus of my J D Stout lecture in 2014, as well as various other public talks and presentations. I have now made my first published foray into the field of memory studies with a paper on the same topic. It is published in a special issue of the Journal of New Zealand Studies 'James Cowan and the Legacies of Late Colonial Culture in Aotearoa New Zealand', edited by Annabel Cooper and Ariana Tikao. The Journal of New Zealand Studies is an open access publication, committed to making research freely available to the wider community. Here is a link to the full text of my own paper. 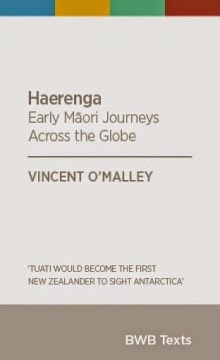 Acclaimed historian Vincent O’Malley has written the latest addition to Bridget Williams Books’ Texts series, Haerenga: Early Māori Journeys Across the Globe. O’Malley’s book tells the stories of early Māori voyagers who, from the eighteenth century on, left New Zealand to travel overseas in search of adventure, commercial opportunities and political recognition. ‘I wanted to cast fresh light on an absorbing aspect of early New Zealand history,’ says O’Malley, pointing out that it is not widely known that the first New Zealander to sight Antarctica was the Māori sailor Tuati, in 1840. In Haerenga, O’Malley collects for the first time the stories of Tuati and other Māori travellers in an accessible short work that will engage both general and specialist readers.